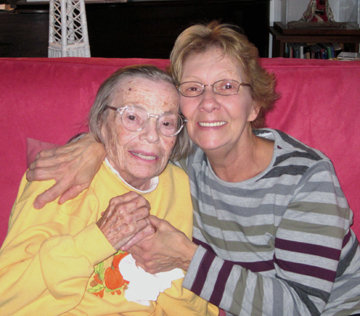 Rose Kiablick of Buckland, Massachusetts, comes every week as a hospice volunteer to spend time with my mother. Rose is a warm hearted great-grandmother … and a wonderful cook. This cornbread recipe, sweetened with local maple syrup, is one of her favorites. It accompanies almost any dish—particularly turkey! 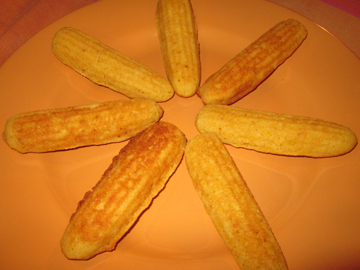 I loved the corn sticks; they were moist on the inside and crunchy on the outside. You may of course use an 8- or 9-inch square pan or a larger iron skillet as well. Timing will vary depending on what you use. The corn sticks took about 18 minutes; a larger pan could take up to 25. If you want to make cornbread stuffing, make this bread TODAY and use it as your stuffing base tomorrow. Preheat the oven to 425 degrees. Lightly grease the pan(s) of your choice. In a bowl combine the flour, cornmeal, sugar, baking powder, and salt. 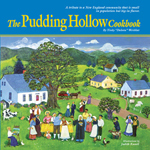 In another bowl combine the milk and butter; then whisk in the eggs, followed by the maple syrup. Stir this mixture lightly into the dry ingredients. Bake until the cornbread passes the toothpick test, about 20 to 25 minutes. Serves 8 to 10. My mother loves her visits with Rose. For much of my life I felt like the Scrooge of Thanksgiving. The holiday and its table left me cold. I didn’t really see Thanksgiving’s appeal. The idea of setting aside a day to give thanks struck me as wonderful in theory. 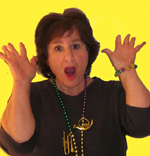 In practice, however, I saw Thanksgiving dinner as a heavy meal with too many dishes, few of which I savored. One problem was the turkey. I’m just not a turkey girl. Even if I brine the darn thing and it’s super moist, it fails to tempt me (although I LOVE the leftovers!). Another problem was the bustle in the kitchen, which made me feel ever so slightly claustrophobic. If I absolutely had to go to family members’ or friends’ houses—if not doing so would hurt their feelings, that is—I would quietly join the eating throng. I would even contribute to the menu. Whenever possible, however, I spent the day on my own—writing, going to the movies (theaters are NEVER crowded on Thanksgiving! ), catching up on reading. And I eschewed turkey when I could. I still fondly recall my long-ago Chinese take-out Thanksgiving. And eating chicken-fried steak on the fourth Thursday in November one year with friends at Threadgill’s in Austin, Texas, was one of the culinary highlights of my life. I guess I must be growing older because for the past few years I have actually enjoyed the hubbub of this holiday. 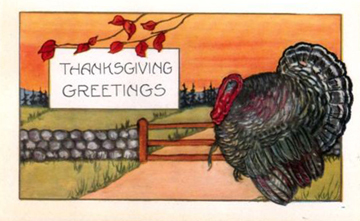 It began, I think, one year when my friends Esther and Mac brought most of Thanksgiving dinner to my house. My family was away … so all I had to worry about was making a couple of dishes and enjoying the company of good friends. Slowly I worked my way back to family Thanksgivings—and to cooking on Thanksgiving. This year is one of those in which I am in charge of the big meal. I’m a teensy bit ruthless when my kitchen is THE Thanksgiving kitchen. I have clamped down a bit on my family members’ desire to eat every odd food they ever enjoyed at any Thanksgiving in the course of their lives. Everyone gets to select one dish that has special meaning. (Sometimes the youngest generation is allowed two choices.) We try ONE new thing. And we prepare as much as we can in advance. We end up with a table that has plenty of variety without being overwhelming. Not overdoing the food gives us a chance to enjoy the company we’re keeping. Amazingly, when I’m not exhausted from cooking I find that I actually like my relatives and want to cook and eat with them. I even manage to find time to give thanks! Today and Wednesday I’ll be offering a couple of easy dishes that might suit readers’ Thanksgiving tables. If you’re too busy cooking to read them now, fear not: you may serve them any time during the cooler months. 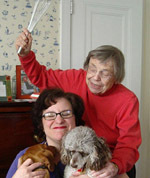 The first comes from my mother’s loving, cheerful aide, Pam Gerry. 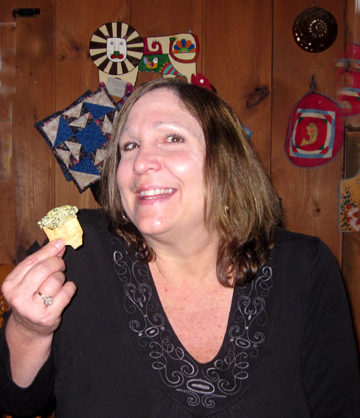 Pam brings this appetizer every year to her family’s Thanksgiving celebration. The recipe has proven so popular among her relatives that it has traveled to a number of states up and down the east coast. It’s easy to prepare in advance. I actually made it last week and divided the mixture in half before adding the final breadcrumbs and cheese. I added them to one portion and cooked it, serving it to guests. I froze the other half to heat and serve on Thanksgiving. If you’re worried that an appetizer might be too much with your turkey dinner, do what my neighbors the Parkers do: have an appetizer/dessert meal the night AFTER Thanksgiving so the family can enjoy the extras without worrying about saving room for turkey! In a small frying pan sauté the onion and garlic pieces in the oil and/or butter until the vegetables soften. In a food processor, combine the spinach and artichoke hearts. Pulse to make them very small. Add the cup of cheese, lemon juice, mayonnaise, cream cheese, and sautéed vegetables. Pulse again to combine thoroughly. If you don’t have a food processor, chop the artichoke hearts well before beating them together with the rest of the ingredients. Place the mixture in a 2-quart baking dish. Sprinkle the top with the bread crumbs and remaining cheese. Bake until the dip is brown around the edges, about 20 minutes. Serve with chips, sliced vegetables, or bread. Most New Englanders see early November as a time for winding down from summer and harvest activities. The leaves dwindle, the air takes on a distinct chill, and farm stands begin closing their doors. For cider lovers, however, this season is a highlight of the year. Here in Franklin County, Massachusetts, we are lucky to have a weekend devoted to the joys of apples and cider, a weekend that seems to become richer each year. Today and tomorrow mark the 17th annual occurrence of Cider Days, a celebration founded by Judith Maloney of West County Cider and her late husband Terry in 1994. This year the festivities include a pancake breakfast, programs and sales at various locations throughout the county, canning classes, a home orchard workshop, tastings galore, and a special cider dinner. Several local eateries will feature apple and cider items on their menus that weekend, including my beloved Green Emporium, where apple-cheddar pizza and appletinis are just the beginning of the apple madness. This morning the Green Emporium featured cooking demonstrations by its chef, Michael Collins, and by Amy Traverso of Yankee magazine, the author of The Apple Lover’s Cookbook. Amy also signed copies of her book, which was published in September by W.W. Norton. Norton sent me a copy of the book to review for a local paper. The book is a real find—a treasure trove of apple information (Amy has unearthed apple varieties completely new to me), stories of trips to orchards, and tempting recipes. Amy has come to Cider Days several times although this is her first public appearance there. “Cider Days is something that my whole family looks forward to every year,” she told me. I’m sorry that I didn’t post this in time to allow you to come to her signing—I’ve been having SERIOUS blog issues, just resolved thanks to my current hero (and always friend) Henry. Luckily, there are more events still to come this weekend. For a full schedule of activities visit this link. For a couple of apple and cider recipes (I’m posting this a little late so we have two today! ), read on…. 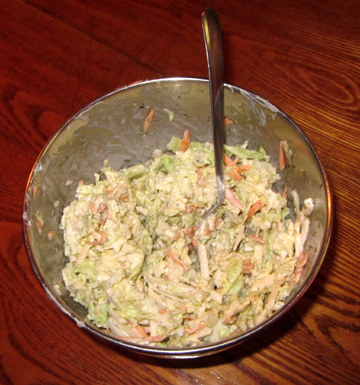 My mother’s darling nurse Pam Gerry told me months ago about her favorite coleslaw, which incorporates dill and apple with the cabbage. I had to wait until fall to have the fresh ingredients with which to make it, however! 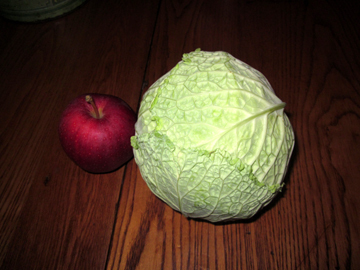 In early October our farm share turned up a small head of cabbage a couple of weeks ago—and we had apples on our trees and a small amount of dill still in the herb garden. The carrot was left over from a previous week’s farm share, and of course the cider vinegar was from Apex Orchards nearby. 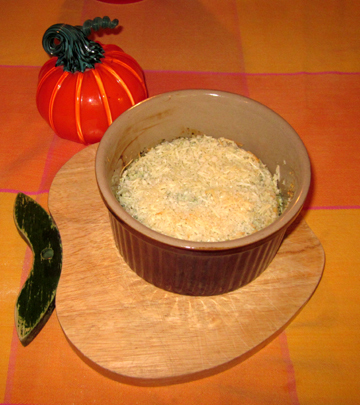 Of course, you may tinker with the recipe and substitute something more conventionally coleslawy (maybe caraway seeds?) for the dill. I loved the fresh flavor it gave to the salad, however. A generous friend sent me some REAL kosher corned beef and rye bread from New York City so I was able to make one of my favorite childhood sandwiches, corned beef with mustard and slaw. We got our cold cuts at a kosher deli where cheese was never mixed with corned beef so I never became a Reuben fan. But I adore coleslaw with my corned beef so between them Pam and Peter send me to heaven! Combine all ingredients in a medium bowl. Stir and adjust seasonings to taste. If you have time, let the mixture sit in the refrigerator for a while to maximize flavor. Be sure to stir it before serving. 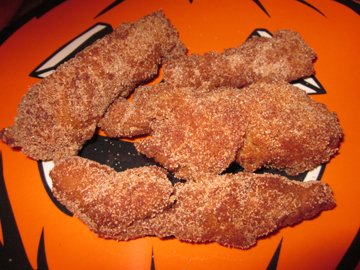 My friend Cynthia O’Connor asked me more than a year ago if I had a recipe for Cider Doughnuts. It took me a while, but I finally got one! Hager’s Farm Market in Shelburne, Massachusetts, will offer a plethora of apple products for this year’s Cider Days, plus the market’s signature fried dough with maple cream. I persuaded Sherry Hager and her daughter Kim to part with the recipe for Sherry’s cider doughnuts, pastries that are particularly light and crispy thanks to the cider and buttermilk in their dough … and to the Hagers’ deep-frying skills. In a bowl combine the flour, baking powder, baking soda, cinnamon, salt, and nutmeg. In another bowl beat the butter and sugar together with electric mixer. Mix in the eggs until they are thoroughly incorporated. Mix in the cider and buttermilk. Dump in the dry ingredients and stir. “Our secret is we let it refrigerate overnight,” says Kim of the dough. The next day preheat the oil to 350 degrees in a large pan or fryer. Roll the out dough on a floured surface; cut it with a doughnut cutter. This can be a little tricky even after refrigeration as the dough is sticky. As you can see from the photos here, I gave up on doughnuts and formed my dough into freeform crullers. 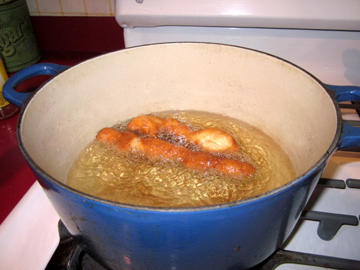 Cook the doughnuts a few at a time until they are brown on each side, a minute or two per side.